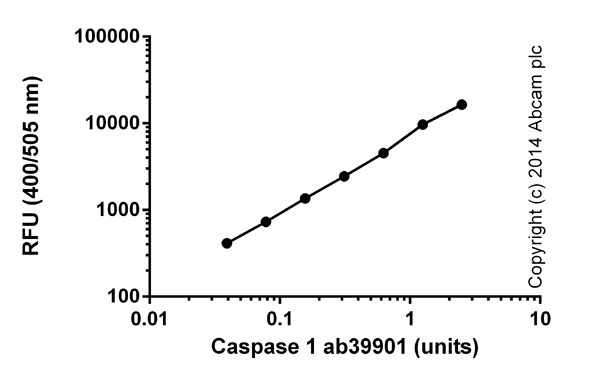 Caspase-1 Assay Kit (Fluorometric) (ab39412) provides a simple and convenient method for detecting the activity of caspase-1, which recognizes the sequence YVAD. The caspase-1 assay protocol is based on the cleavage of substrate YVAD-AFC (AFC: 7-amino-4-trifluoromethyl coumarin). YVAD-AFC emits blue light (Em=400 nm); upon cleavage of the substrate by caspase-1 or related caspases, free AFC emits a yellow-green fluorescence (Ex/Em=400/505 nm), which can be quantified using a fluorometer or a fluorecence microtiter plate reader. Comparison of the fluorescence from a treated sample with an untreated control allows determination of the fold increase in caspase-1 activity. Caspase-1 (ICE, IL-1beta Converting Enzyme) is the prototypical member of the ICE family of proteases/caspases. Functional assays: Caspase 1 assay kit (ab39412)Image from Badding M.A et al., PLoS One 10(4). Fig 6b. doi: 10.1371/journal.pone.0124368. Badding M.A et al investigated the cytotoxicity of Indium-tin oxide (ITO). Previously,ITO had shown to be cytotoxic in cultured cells and pro-inflammatory in pulmonary animal models. ITO is used to make transparent conductive coatings for touch screens and liquid crystal display electronics. 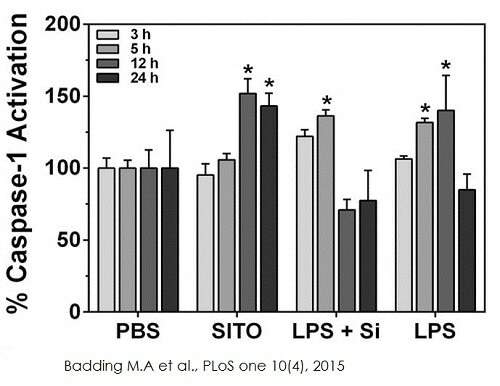 RAW cells were plated at 5 x 105 cells/well and treated with SITO, LPS, or Min-U-sil (cells were first primed with LPS). Cells were washed, lysed, and 100 μg of lysates were assayed using Caspase 1 assay kit (ab39412). PBS was used as a control. All conditions were run in duplicate wells and three independent experiments were performed for each time point. Titration of the caspase 1 (ab39901) (background signal subtracted, duplicates; +/- SD). Publishing research using ab39412? Please let us know so that we can cite the reference in this datasheet. 1- The YVAD-AFC substrate is pearmeable into the cells? 2- The DTT is included for what? For doing the caspase-1 assay the cells are lysed and then treated with the substrate. Thus, cell permabilization is not an issue. A reducing environment is required for the caspases to remain stable in solution and retain activity. This is why DTT is used. Hello, I was wondering if the lysis buffer that comes with the Casapse-1 activation assay contains protease inhibitors? We typically add those to our lysis buffer for lysates run in western blots. We plan to lyse cells and use part of the lysate for this assay/kit and the rest will be run in western blots. Thank you. The lysis buffer in the kit does not contain any protease inhibitors. The assay relies on keeping the samples on ice to minimize degradation, until the assay at 37C. You could add protease inhibitors to a portion of you lysates set aside for western blots immediately after homogenization, but do not add them to the portion you intend to use for the assay, as caspase activity could be inhibited. For a western blot test, I suggest loading a lane in a gel with a sample that did not receive inhibitors, and compare the result to a lane that was loaded with sample + inhbitors, to see if protease inhibitors are necessary to keep caspase 2 intact. What is the limit of detection for the Caspase-1 Assay (ab39412)? ab39412 has sensitivity of 0.05 - 0.5 ng. Kindly contacted us regarding the Cell Lysis Buffer included in this kit. They are using a virus in there samples and are worried whether the detergent in the buffer may inactivate this virus. They ask if we might be able to share which detergent(s) are used in this lysis buffer or if they might use an alternative buffer such as RIPA? There is 1% Triton-x-100 in the lysis buffer. For best results we recommend using the cell lysis buffer provided. If absolutely necessary for the virus, you may use the RIPA buffer with this kit, but results may vary. Customer is getting a very high reading in her sample buffer only (blank) control: Empty reads about 300, blank about 800. Is this normal? Can rule out bleed over from other wells as well as a contamination with the standard. Ist es vielleicht möglich, uns eine Excel Tabelle mit Ihren Ergebnissen zukommen zu lasen? Das Labor würde sich gerne einmal Ihre Messungen ansehen. What is the range of sensitivity of this assay? Unfortunately we do not have a sensitivity range determined for this kit. Fold-increase in Caspase-1 activity can be determined by comparing the results of induced samples with the level of the untreated control. Please let me know if you have any more questions. I'm using mouse left ventricle with this kit. I was wondering what type of fold increase has been seen before when testing this kit? Thank you for your inquiry. This result would depend on a number of factors including the cell type in which the Capase-1 activation is being studied, the levels of Caspase-1 activation after induction of apoptosis, time-course for Caspase-1 activation after apoptosis induction. We do have the following citations for this kit which will be of help to you to give you an idea: Caspase-1 Fluorometric Assay Kit Cheng, S. C. et. al. The dectin-1/inflammasome pathway is responsible for the induction of protective T-helper 17 responses that discriminate between yeasts and hyphae of Candida albicans. J. Leukoc. Biol., Aug 2011; 90: 357 - 366. Cihakova D et al (2008) Am. J. Pathol. 172: 1195-1208. Coletti, D., et al. (2002) EMBO J. 21:631-642. Duncan JA et al (2009) J. Immunol. ; 182: 6460-6469Koenen, T. b. et. al. Hyperglycemia Activates Caspase-1 and TXNIP-Mediated IL-1β Transcription in Human Adipose Tissue. Diabetes, Feb 2011; 60: 517 - 524. I hope this information helps. Please contact us with any other questions. How should tissue be prepared to use with the kit? Any specific protocol? After lysing tissue in the cell lysis buffer, can I use this tissue lysate in a Western blot? Thank you for your call today. I have heard back from the lab about your questions: 1) For tissues, homogenize 10 mg of tissue in 200 ul of lysis buffer. Spin out debris and add 50 ul of supernatant into a well of the 96-well plate then proceed from Step 4 on the protocol. 2) You can use the lysate for Western blot. I hope this information is helpful, but please let me know if you have any further questions. Products ab39470 and ab39412. What sensitivity (pg, ng, ug?) do these products range from, for the detection of Caspase1? Thank you for your enquiry. The colorimetric assay has sensitivity of about 5 ng and fluorometric is about 10-100 fold more sensitive. Fluorometric assay is recommended for tissue samples. I hope this information helps. Please do not hesitate to contact us if you need any more advice or information.